Studio(s): Diamond Film Productions, G-BASE, Tucker Tooley Entertainment. 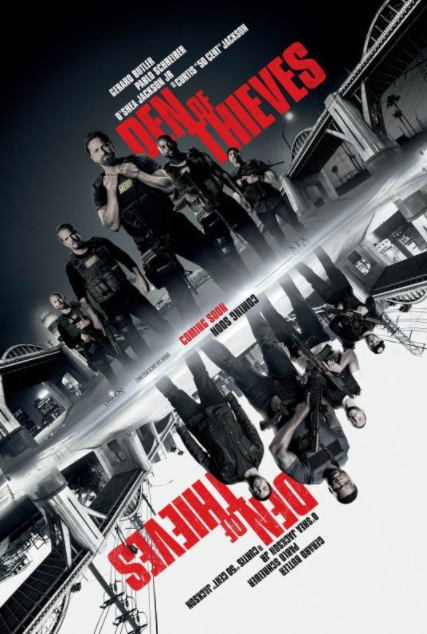 Cast: Gerard Butler (‘Big Nick’ O’Brien), Pablo Schreiber (Ray Merrimen), O’Shea Jackson, Jr., (Donnie Wilson), Curtis ’50 Cent’ Jackson (Enson Levoux), Meadow Williams (Holly), Maurice Compte (Benny Borracho’ Magalon) Brian Van Holt (Murph Connors), Evan Jones (Bo ‘Bosco’ Ostroman), Mo McRae (Gus Henderson). Story: A Los Angeles crime saga in the vein of Heat, Den of Thieves follows the intersecting and often personally connected lives of an elite unit of the LA County Sheriff’s Dept. and the state’s most successful bank robbery crew as the outlaws plan a seemingly impossible heist on the Federal Reserve Bank of downtown Los Angeles. Source(s): Movie Insider.